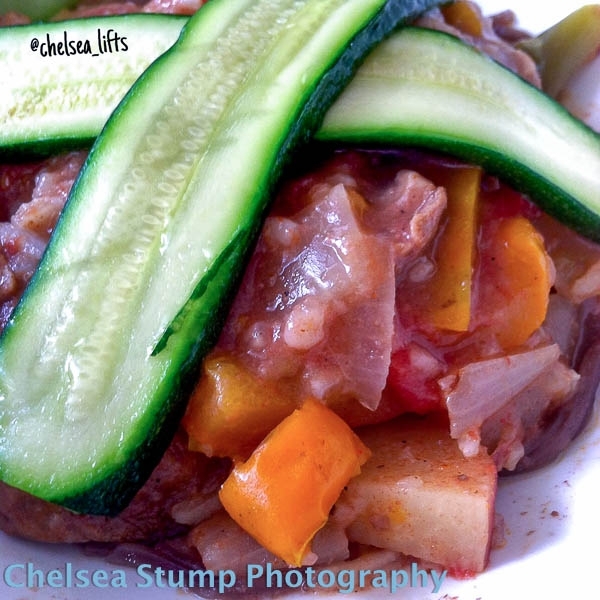 A succulent slow-cooked beef stew mixed with green, yellow, and orange peppers, stewed tomatoes, onions, and red russet potatoes. Topped with some lightly sautÃ©ed zucchini. Dice all vegetables (except zucchini) and add into Crock-Pot along with the uncooked beef stew meat, broth, and spices. Cook on low heat for four hours, stirring every hour. After four hours, add in the cornstarch and stir until mixed altogether. Let cook and stew for another 30 minutes. Check and make sure that potatoes and vegetables are all cooked down after the full 4.5 hours of cooking. If so, it is ready to serve. If not, continue cooking until all ingredients are cooked. Slice zucchini into 12 slices and sautÃ©e in olive oil. Cross two slices over each bowl.